OzVMX – Good old fashioned Dirt Bike fun! What is the OzVMX Resto Expo? If you love old dirt bikes the OzVMX Resto Expo is an event not to miss. Laid out on a luscious prime turf farm on the banks of the mighty Hawkesbury River, restorers and collectors of old dirt bikes will display their pride & joys for all to admire and enjoy. Mingle with more than 500 fellow enthusiasts and soak up the atmosphere as you marvel at the moto artistry of many master restorers. Get up close and personal with and admire rare models form the 60s, 70s, 80s & 90s you haven’t seen for decades. You will be amazed at how many of the bikes are in better than showroom condition. Premium Riverside Campsites are available Friday & Saturday nights with a live vocalist playing Friday night and a band playing Saturday night. If riding is your thing, ride the Pre-78 Grass Track, the famous Dargle Motocross track or the Trail Ride/Vinduro Loop. Got a bike or parts to sell? The Swap Meet is free with all tickets. 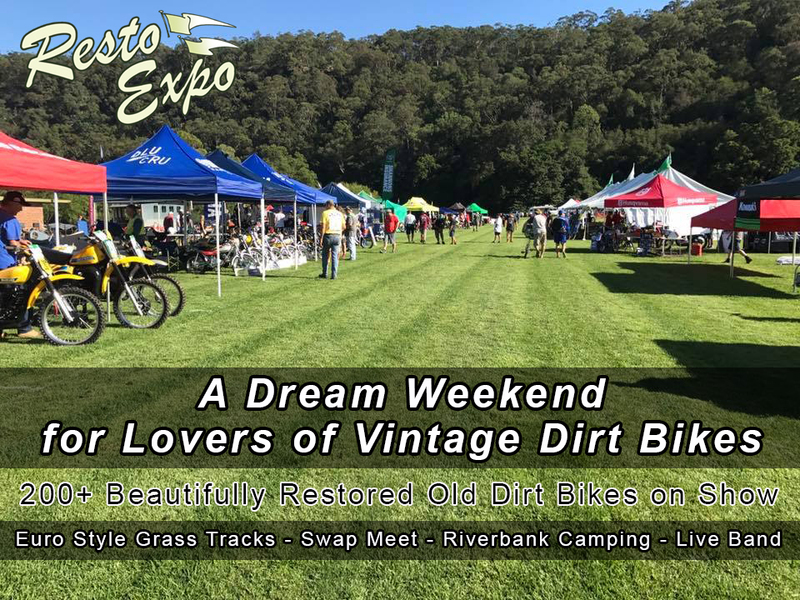 All in all it is a dream weekend for lovers of old dirt bikes in a relaxed and beautiful country setting. Buy your Early Bird tickets now and save. Go to our Tickets page.